TRANSFORMING CHILDREN INTO SPIRITUAL CHAMPIONS provides wake-up statistics from Barna Research Group that reveal what effective churches do to reach our largest hidden mission field - our children! As the seminar addresses why children's ministry is vital to church health, it provides specific steps to success from churches that thrive in children's ministry. DEVELOPING A BIBLICAL WORLDVIEW discusses the need for congregations to develop a biblical worldview and how to strategically accomplish this goal. You will learn what a biblical worldview is, how to teach it to your assembly, and what effective churches have done to address the issue. 2 DVDs, 70 and 65 minutes each: 135 minutes total. 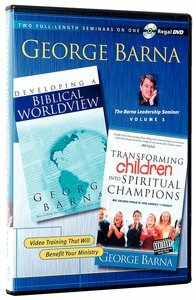 About "Transforming Children Into Spiritual Champions/Developing a Biblical Worldview"